le macaron, with its treasure to the short lived culinary innovations trove of patisserie, has arrived that are rampant in the city. These four on Delray’s East Atlantic hundred year old favorites will hold Avenue courtesy of Herve and their own in the avenue’s gourmet Cathy Rouge. The main pantheon. 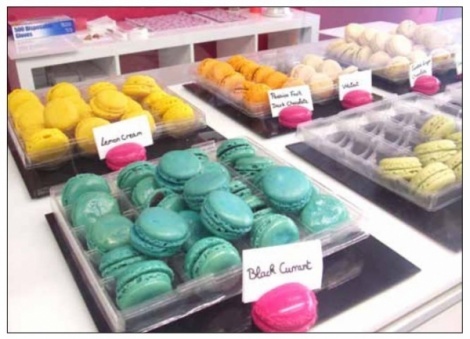 attraction of this eye-catching The shop also provides a fabulous sweet shop is the renowned gastronomic gelato indulgence for French pastry/cookie, the patrons of all ages. Every flavor is macaron. History has it that Queen Marie de Medici, the wife of King Henry IV, brought the pastry recipe when she arrived in France in 1600. Since the Seventeenth Century, this sweet delicacy has undergone few changes. There is no better place to discover the joy of macarons than at this charming confectionary store which opened just a few months ago. These petite wafers of unparalleled lightness are prepared from ground almonds, sugar and soft meringue. Two portions are joined together with a variety of fillings ranging from grenache, rich creams, homemade jams and other prime ingredients. Macrons come in a rainbow of flavors and seeing the brilliant assortment elegantly displayed behind the counter is a show-stopping experience. A palate-tingling procession of Basil, Rose, Caramel and Columbian Coffee macarons definitely confirmed our impression that this small, energetic shop is a youthful antidote imported from France and none is to be found elsewhere so invitingly displayed. Lavender is not only a fragrance, but is often used as a seasoning for gourmet specialties such as the sparkling colorful lavender gelato which is a favorite not only in Europe, but also in Delray. Try the crème brule and apple pie gelatos - cool and creamy variations of their name sakes. Raspberry and key lime flavors are also unforgettable as is the mango sorbet, another winning French original. Gorgeous calorific American chocolates have their own display featuring artisanal bites crafted by David Ramirez and William Dean. Each sculpted collection has a range of colors and supremely enticing flavors. Like all the other epicurean treats, the candy gems are made in small batches, without preservatives and from premium ingredients. The friendly, obliging staff serves a variety of fresh brewed coffees (espresso, cappuccinos, lattes) as well as a cross section of fine teas and hot chocolate. Depending on availability, you may also be able to feast on fresh baked croissants and the other petit classic French pastry, the madeleine. For any occasion, Le Macaron can provide all the opulent dessert treats you need. Make Mother’s Day and Memorial Day even more special with gift boxes filled with macarons.